Zimbabwe has launched a new currency - the bearer cheque - in an attempt to ease the country's severe economic crisis. The central bank said the cheques were only a temporary measure and would not replace the Zimbabwean dollar. Inflation rose to a unprecedented 426% in August, one of the highest rates in the world. There have been massive money shortages but the government has resisted calls for larger denomination banknotes. The cheque is seen by some as a way of avoiding higher denominations. "It can only be so they can tell Mugabe they haven't had to issue a bigger banknote," a senior Harare bank executive told the government-owned Herald newspaper. "He seems to need reassuring that Zimbabwe is not really a banana republic." The bearer check will be valid as legal tender until 31 January and will be dispensed from cash machines. The notes can be used to buy goods and services just like banknotes, officials say. The central bank in August issued a range of local travellers' cheques valid only in Zimbabwe but described by some people as "funny money," many businesses refused to accept them. Queues outside banks are now commonplace and sometimes the crowds turns violent. Customers have slept on pavements in order to be first in line when the banks open. 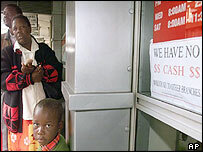 Many banks are only allowing withdrawals of less than 10,000 Zimbabwean dollars ($12) a time. Zimbabwe's desperate economic situation is attributed partly to the government programme which seized commercial farms from white farmers for redistribution to black Zimbabweans.